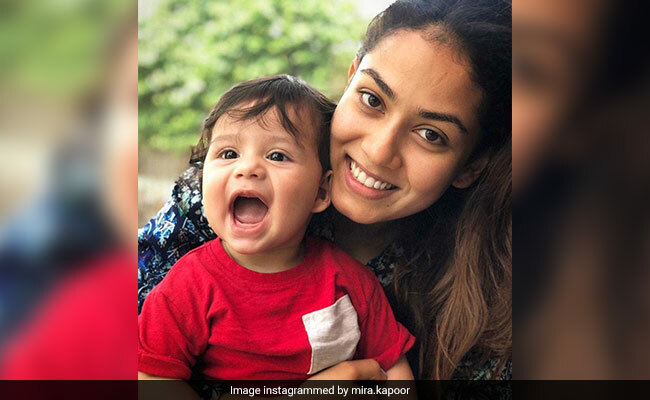 She captioned it: "Small wonder"
Mira Rajput's latest Instagram post will make you smile and how. Why, you ask? Well, the picture features Mira along with her son Zain and we must tell you that the mother-son duo look adorable in the picture together. Little Zain can be seen smiling as Mira wraps her arms around him. Mira captioned the picture in the best possible way and wrote: "Small wonder." Just like us, Mira's fans also loved the picture and the 1 lakh likes on the picture prove that. Fans couldn't help but comment on the oh-so-adorable picture. Mira's close friend and filmmaker Abhishek Kapoor's wife Pragya Yadav made several heart emoticons in the comments section. Comments like "adorable" and "cute" kept popping up on Mira's post. A few days ago, Mira delighted her fans by sharing a super cute picture of Zain and her daughter Mira. "Zizi... I decided to wear your T-shirt because it's still a bit big for you. It fits and I think I'm going to keep it," read the caption on Mira's post. She accompanied the post with the hashtags "#sharingiscaring" and "#lifeintechnicolor." Baby Zain might not make appearances on his parents' Instagram profile very often but whenever he does, we simply love it. Remember the "limited edition" picture, in which the mother-son duo could be seen twinning in white outfits. How cute was that! Mira Rajput and Shahid Kapoor welcomed Zain in September last year. Besides Zain, the couple are also parents to Misha. Mira Rajput and Shahid Kapoor got married in 2015.